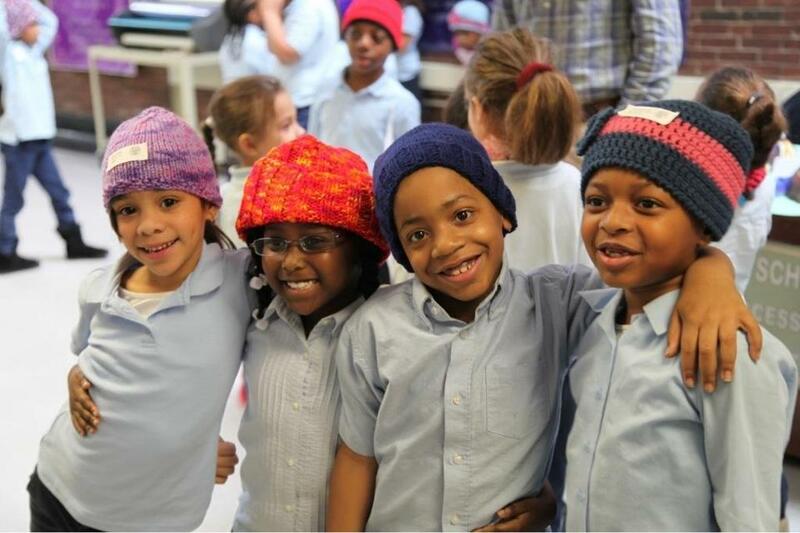 Students at the Tobin School in Boston wear hats from Caps for Kids. At a store, in a drawer, in a storage tub in somebody’s already too crowded office, it’s merely yarn: mismatched skeins with different dye lots, acrylics, wools, blends, some of it trash, but then, all of it, eventually, stunningly, treasure. At the end of a day, or a month, or a year. It’s not quite the stuff of fairy tales, not as dramatic as spinning straw into gold. But it’s close. Very close. Knit one, pearl two. Cast on. Bind off. Repeat. Skip. Space. Increase. Decrease. Slip, knit, pass over, and eventually you have a hat that keeps a child’s head warm. Or mittens that cover his or her hands. Or a soft blanket. Or beautiful, Punky Brewster impossible to duplicate, fun socks! “Thank you for the most wonderful hat in the world,” a child writes to Caps for Kids, such a small name for a huge, under-the-radar project that has been creating and donating handmade knitted and crocheted items to Boston children every holiday season for 29 years. The project started in a knitting shop in California, migrated here and found its way to Brigham and Women’s Hospital, then, in 1999, the Dana-Farber Cancer Institute. That year, 107 lucky Boston kids got one-of-a-kind handmade hats. Last year, Caps for Kids donated 11,099 personally crafted items to infants, toddlers, and kids in schools, community centers, and hospitals all over Boston. Candace Lowe, administrative director of the Susan F. Smith Center for Women’s Cancers at Dana-Farber, is the reason Caps for Kids is outfitting so many children with speciality store quality items. “What’s all this?” people ask when they squeeze into Lowe’s small office and see the tiny room crowded with bins of donated yarn and more bins overflowing with colorful hats. Then it’s “Wow” and “I want to do this.” And colleagues tell colleagues, and mothers tell daughters, and patients tell patients, and friends tell friends. Which is why there are now hundreds of knitters in Boston, as well as nuns in New Hampshire and boaters in the Bahamas and transplanted Bay Staters in Texas and North Carolina, hurrying to get one more hat or scarf or pair of mittens finished before the Dec. 1 deadline, trying to best their own record, again. And get the goods over to Joan Casby at Brigham and Women’s, who sorts and coordinates the delivery of everything. Each hat is tagged with the name of its creator. Some knitters belong to groups: The “Mad Hatters,” “Tight Knit Group,” “Medford Jingle Bells,” “Knotty Ladies.” These hats are tagged with these names. Years ago, Caps for Kids was mentioned in the Globe’s Confidential Chat. As a result, the Greater Boston Knitting Guild got involved with Caps for Kids. Last year, the Guild donated more than 800 items that keep Boston’s children warm. Most of us don’t knit our socks and hats and scarves. We buy them, 100 percent acrylic, made in China, 20 percent off. And they’re fine. But what we buy is not unique and never made with love. Every hat, scarf, teddy bear, puppet, doll blanket, sweater, headband is. A hat that will warm both a body and a heart. To donate items or yarn to Caps for Kids, please contact Beverly Beckham at beverlybeckham@me.com.